You can't (or shouldn't) use your smartphone as a hammer, but that doesn't mean you can't use it in place of a number of other items you probably keep stored away in your toolbox. For checking levels, measuring short distances, and even as a reference guide, your smartphone is an amazing tool that saves you time and space. Here's how to use it to its full advantage. Before you start any DIY project, you need to plan out how you're going to tackle it. Your smartphone makes this incredibly easy right out of the box, but plenty of apps exist to help you along the way as well. To start, your smartphone's default apps already make planning a project easy. Your notepad can hold the measurements you need, your camera snaps pictures of parts that need replacement, and you can create a shopping list in any writing app. Additionally, you can grab specialised apps for all types of projects. 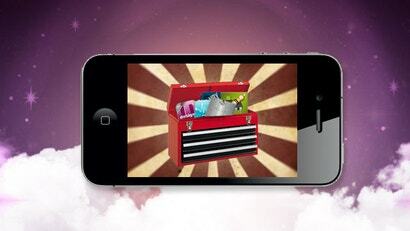 Handy Man DIY for iPhone keeps track of measurements for all your various projects. Home Design 3D for iPhone and 3D Interior Room Design for Android help you plan out the layout of an entire room. Photo Measure for iPhone and My Measures for Android allow you to take a picture and draw measurements directly on the image so you have an accurate look of your house with you all time. Countless other options exist for planning projects, and many of them are tailored directly to the type of project you're doing. If you're a home improvement nut, there's a good chance your "Project Planning" folder will be full of a bunch of different apps. Since the iTunes Store and Google Play store first opened, they have been flooded with all types of tool replacements. At first it was just torches and levels, but a few more have entered the arena in recent years. Advanced Ruler Pro for Android, for instance, can measure distance with just a picture. Acoustic Ruler Pro for iPhone measures distance with acoustic sound from your headphones. You can also pick up singular all-in-one apps such as iHandy Carpenter for iPhone or Smart Tools for Android that stuff a ruler, measuring tool, compass and level into one app. Basically, whatever tool you need that could possibly be emulated on a phone exists, and they're incredibly handy when you don't have the physical tools around. Your smartphone is also a great replacement for all the manuals, books and other reference materials you have around. Built-in apps such as YouTube are a must-have for any DIYer, and loading up your smartphone with your manuals is a great way to reduce clutter and have all the guides you'll ever need with you all the time. From personal experience, this is also helpful in case you forget to write down a model number when you're shopping for a repair. Much like the wide variety of planning utilities, the reference materials are just as widespread. Circuit Playground for iPhone and ElectroDroid are reference tools that help you decode resistor colours, voltage and more. Plenty of other reference tools exist for different projects, so regardless of what hobby you call your own, you'll likely find something useful. It's easy to forget that your smartphone is a useful utility for real-world projects. While its primary usage will always be in the digital realm for most of us, your smartphone can make a fine replacement for a lot of the items in your toolbox. How do you use yours? "You can’t (or shouldn’t) use your smartphone as a hammer"
Albeit, a slow horridly ineffective hammer!